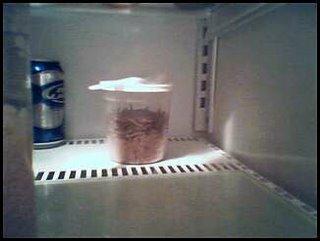 These are some worms who live in our refrigerator. The only reason they are allowed is that they are for the bluebirds, and the bluebirds are my favorite, because of their sweet little song and their cuteness. These are two qualities non-birders enjoy. Whereas birders, actual birders, are generally more into what birds are rare and such, I'm into a) birds that are adorable and b) California Condors. Because they're huge. These particular mealworms were purchased at Wild Birds Unlimited. When I go to the Harris Teeter in Chapel Hill North to get something for dinner, some paper towels maybe, it takes all my might not to waltz into Wild Birds Unlimited and buy everything in the entire store for J. I know I make fun of him, but if you were to see him in the store, interacting with the store owner, who likes birds so much he's opened his own bird store franchise, well, you'd understand. First of all, they've got a lot of cool things that you can't just get at Target, or wherever you choose to buy your birding materials. They have the Flydentifier (which nobody talks about except me, it turns out) as well as a host of other specialty bird items. CD's and wooden houses and cement bird baths. But I don't care about any of that. I know many do, but I don't. What I like is the couple who owns the store. Usually it's this very friendly gentleman, who sold us the mealworms yesterday, but I hit the jackpot just before Christmas when I got to interact with both he and his wife and I was buying J his advanced pole system ("APS" for short - get with the program!) The two of them proceeded to tell me the story of how she'd bought him the APS system for Christmas one year. How she couldn't wrap it, because, you know, it's a bunch of metal poles...the look on his face when he opened it. And while I know I'll never be that to my husband - a fellow amateur ornithologist, and I'll never, ever bring binoculars anywhere, much less try and decide which pair would be best to pack for a trip - to New York City - all I want out of life is that kind of love. The kind of love that makes you excited to wrap up birding toys for your partner in life. The kind of love where you're so into the bird toys, and so into eachother, that you don't mind telling a stranger all about it.